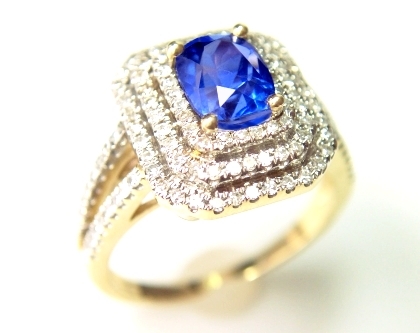 Sapphire engagement rings, diamond and sapphire rings. The Planetary Gems Co. 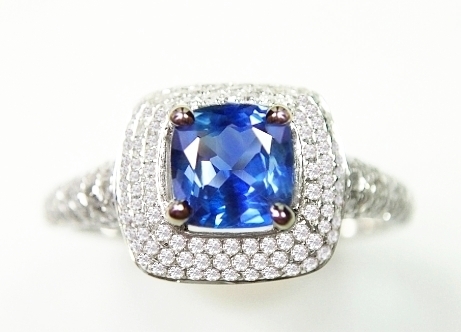 Wondrous, 3rd party certified unheated, Ceylon color change sapphire & diamonds e-ring. 14K white gold, sapphire & diamonds e-ring, 2.90 grams of gold, mounting a center, 3rd party certified unheated, Ceylon color change sapphire, weighting 1.19 cts., medium, vivid, violetish-blue color in daylight changing to violet-purple in incandescent light, excellent, round, mixed cut, measures 5.93-5.98mm in diameter by 4.30mm deep, eye flawless, VVS1-2 type2 in clarity, from the gem fields of Marapana, Sri Lanka. The very well crafted and elegant halo, diamond ring has 0.31 cttw. of single cut diamonds, VS-SIs in clarity and G-H in color,(very white and eye clean), all micro pave set. Size is 6 1/4, but we can re-size it for you, 1 size up or down, free of charge (for more than 1 size sizing a small, extra fee will apply). Simply beautiful and rare. And at such great price. 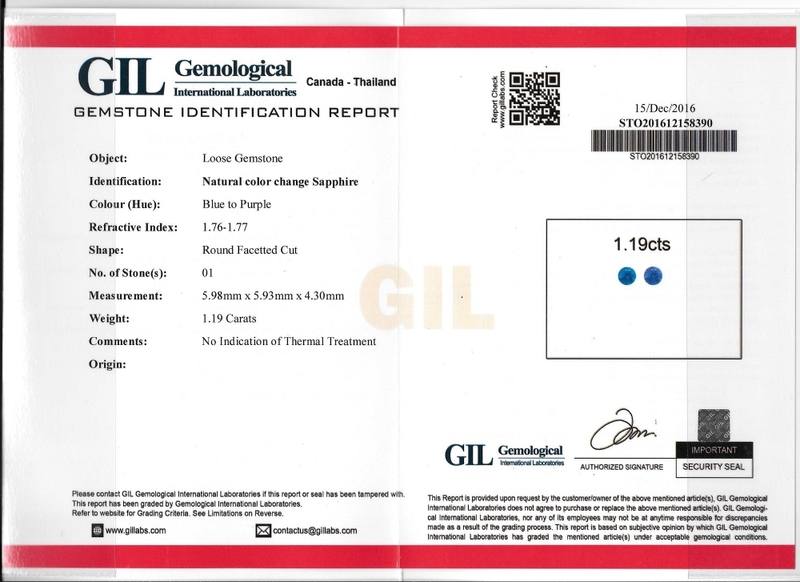 Center sapphire is certified by GIL Bangkok as color change and unheated. Classic & Rare. 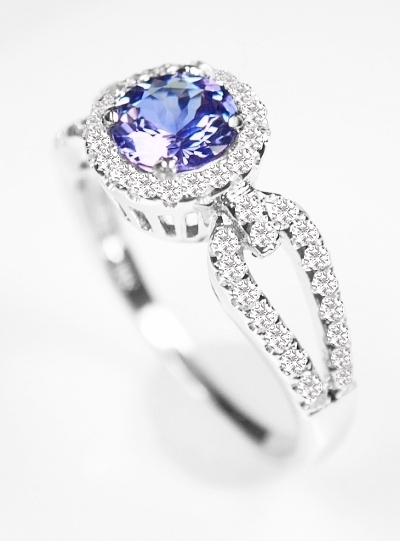 A most beautiful, 14K White gold, sapphire & diamond e-ring, 2.32 grams of gold, featuring a rare, unheated, Ceylon purple sapphire, weighting 0.95 cts., perfect, medium-dark, purple color, masterly executed, round "flower" cut, and measuring 6.15mm in diameter by 3.17mm deep, eye flawless, VVS1 from the gem fields of Elahera, Sri Lanka. 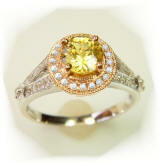 The very well crafted & elegant, 14K White halo, split-shank, diamond ring incorporates 0.37 cttw. of single cut diamonds, SIs in clarity and G-H in color,(very white and eye clean), all micro pave set. Ring size is 6 1/2, but we can re-size it for you, 1 size up or down, free of charge (for more than 1 size sizing a small, extra fee will apply). 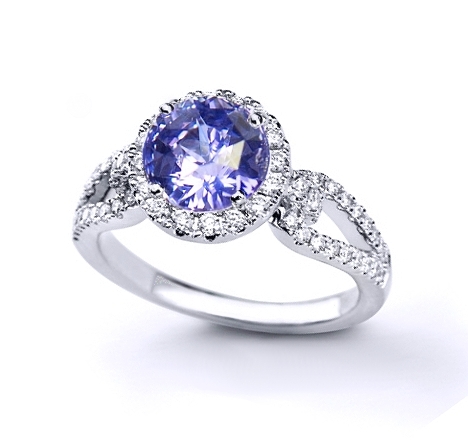 Pure purple, (natural & untreated) is one of the rarest of all colors in the sapphire family. Simply delightful, a must have if you love the rare & classic at the same time. Gorgeous. 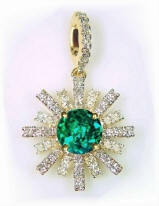 A most luscious 14K yellow gold "star" diamond pendant, 1.85 grams in gold weight and 7/8" long (including the bail, which will accommodate any size chain), featuring a most beautiful, with a true emerald color, Colombian emerald weighing 0.79 cts., fine, medium-dark, summer green color, very slightly bluish, perfectly executed, round, mixed cut, measuring 6.02mm in diameter by 3.97mm deep, good transparent crystal, SI1 type3, from the world famous Muzo mine, Colombia. The "star" pendant has 0.33 cttw. total weight of single cut diamonds, VS-SIs in clarity and G-H in color (very white and eye clean), all micro pave set. What an elegant and unique diamond pendant with a most enthralling Colombian Muzo emerald round that is fantastic in color, clarity and eye appeal. And what a great price too. Uniquely gorgeous, well crafted, 18K yellow gold, flex rhomboid with very rare Sciacca, volcanic pink-orange coral. 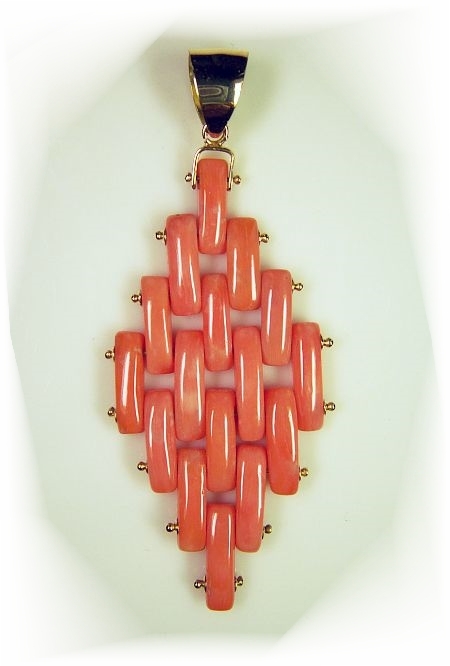 An unique & rare, 18K yellow gold, Italian made, Sciacca coral pendant, approx. 23.50 cttw. of Sciacca coral and 1.3 grams of 18KY gold, measuring 69mm long x 29mm wide (2.75" x 1.15"), excellent and clean surface on this connoisseur coral from off the coast of Sciacca, Sicily. Sciacca coral, which is nowadays very strictly protected is a coral of volcanic origin and prized by collectors for its unique orange-pink color. 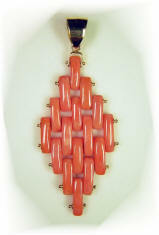 This pendant is very flexible due to its "Rolex oyster" design and adhere very well to the skin. Great & rare find. Lovely no heat blue sapphire and diamond e-ring. 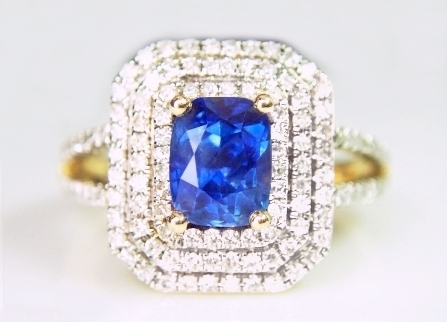 14K White gold diamonds & sapphire e-ring, 2.7 grams of gold, featuring an unheated, Ceylon blue sapphire, 1.01 cts., medium, velvety & with intense flair, "cornflower" blue color, perfectly executed, "antique", square cushion, mixed cut, measures 5.72x5.43x3.18mm, eye flawless, VVS1 from the gem fields of Marapana, Sri Lanka. The well crafted and elegant triple halo, diamond ring has 0.685 cttw. of single cut diamonds, on both 3-tiers head and shoulder shank, SIs in clarity G-H color, (very white and good clean), all micro pave set. Ring size is 6 3/4, but we can re-size it for you, 1 size up or down, free of charge (for more than 1 size sizing a small, extra fee will apply). Really beautiful and at a price cannot be beaten anywhere else. Exotic. 14K two-tone, diamonds & sapphire e-ring, 3.25 grams of gold, mounting a center, unheated, Ceylon yellow sapphire, weighting 1.05 cts., medium, vivid, greenish-yellow color, masterly cut in a 5.95mm round, "flower" cut (and 3.8mm deep), eye flawless, IF-VVS1 from the gem fields of Elahera, Sri Lanka. 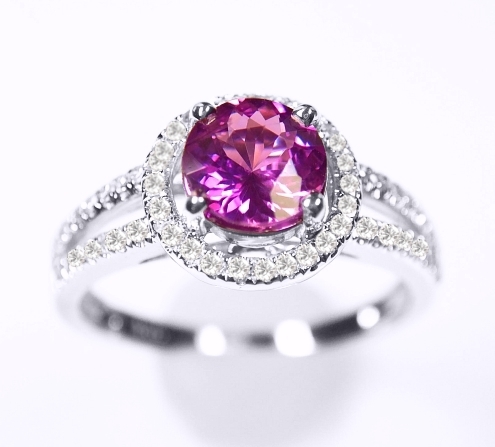 The very well crafted and elegant, Rose & White gold halo, diamond ring incorporates 0.33 cttw. of single cut diamonds, SIs in clarity and G-H in color,(very white and eye clean), all micro pave set. Ring size is 6, but we can re-size it for you, 1 size up or down, free of charge (for more than 1 size sizing a small, extra fee will apply). Absolutely gorgeous, an ideal, beautiful gift priced at an incredible low, low price... and we have no reserve on this ring setting. Sensuously lovely. 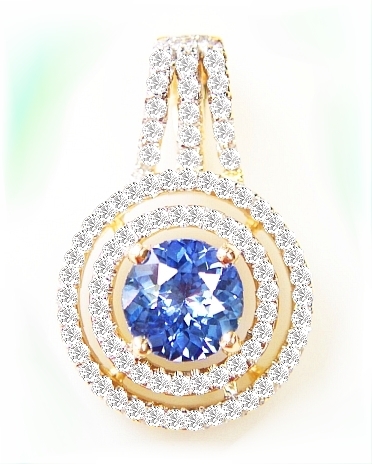 14K yellow gold diamond & unheated, Ceylon blue sapphire pendant, 2.1 grams of gold, mounting a center, unheated, Ceylon blue sapphire, weighting 0.92 cts., vivid, medium, open "cornflower" blue color, masterly executed, round, "flower' cut, measuring 5.85mm in diameter by 3.30mm deep, eye flawless, VVS1 from the gem fields of Ratnapura, Sri Lanka. The double halo, yellow gold pendant is 3/4" long and 1/2" wide, mounting 0.42 cts. total weight of single cuts diamonds, VS-SIs in clarity and G-H in color (very white and eye clean), all micro pave set. 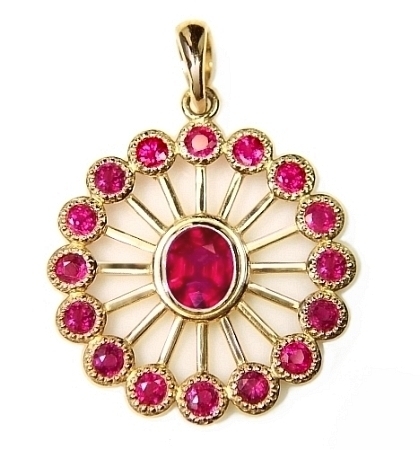 A most gorgeous & effulgent pendant that can accommodate any size chain. 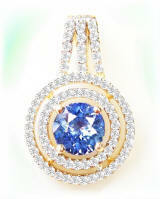 At this price, you should not think too much, ...just the diamond pendant itself is worth the money. We guarantee it much more glorious & lustrous in person. Magical & hypnotic. 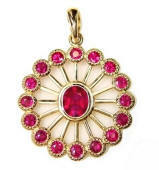 A most ravishing and beautiful, astrological, "Sun" talisman crafted in 14K yellow gold, 3 grams in weight, mounting a center, unheated, natural Vietnamese ruby, weighting 0.79 cts., top, "pigeon's blood red color, eye clean, VS type2 from the Luc Yen mine, Vietnam. The outer, granulated spoked frame terminates to a group of 16 round Burmese rubies, weighting 1.53 cttw., 2.5mm rounds, very bright and lustrous "neon", pinkish-red color, eye clean, VVS type2 from the gem fields of Mong Hsu, Upper Burma. They are bead set in a wonderful granulation motif. 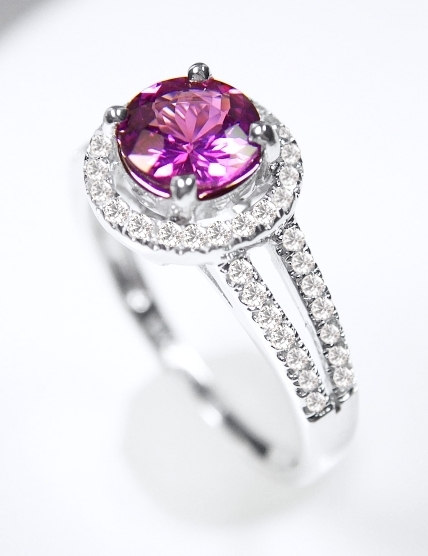 Total carat weight of rubies is 2.32 cts. and the center stone touches the skin. Well, it is just gorgeous, spiritually compelling and crafted very well. Very low price for all this work and quality stones! Yes, this can be used for astrological, Vedic purposes. 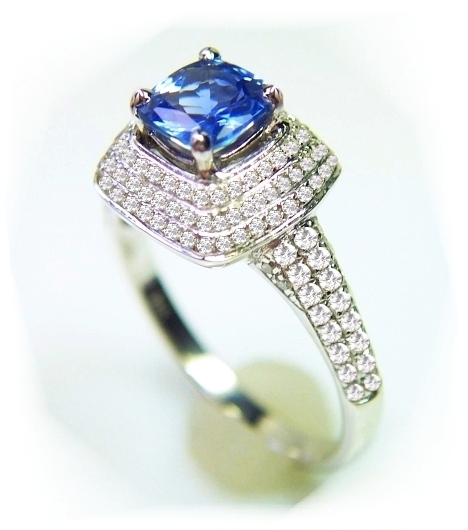 Ceylon Color Change sapphire & diamond e-ring. 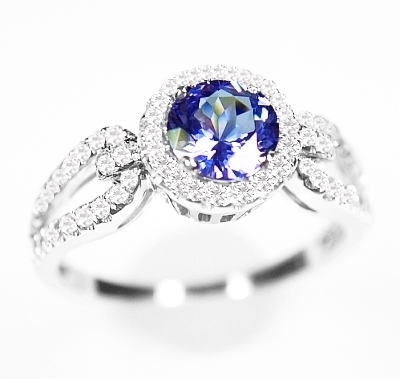 Adorable, 14K White gold, sapphire & diamond e-ring, 2.79 grams of gold, featuring a rare, unheated, Ceylon violetish-blue, color change sapphire, weighting 0.81 cts., perfect, medium-dark, violetish-blue color in daylight, changing to mid purple with pink flashes in incandescent light, masterly executed, round "flower" cut, and measuring 5.70mm in diameter by 2.98mm deep, eye flawless gem, VVS1 in clarity, from the gem fields of Marapana, Sri Lanka. 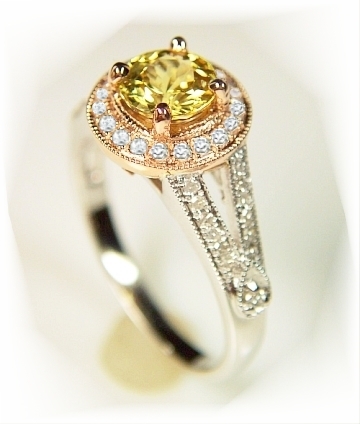 The very well crafted and elegant halo, diamond ring has 0.31 cttw. of single cut diamonds, VS2-SI1 in clarity and G-H in color,(very white and eye clean), all micro pave set. Size is 6 1/4, but we can re-size it for you, 1 size up or down, free of charge (for more than 1 size sizing a small, extra fee will apply). Pics are OK and show the ring shapes & forms, but in real life, well, you have to see it. Simply gorgeous...and what a low price here.